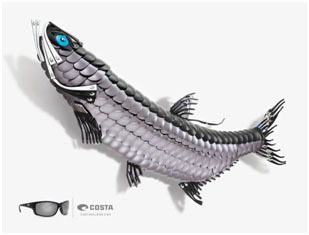 At first glance, the fish sculptures appearing in a new ad campaign for Costa Sunglasses look a bit robotic. 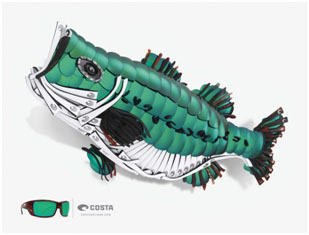 But upon closer inspection, you can see what really makes this fish art so unique — the fish mounts are built entirely out of parts from Costa sunglasses! The company hired artists to build three species out of sunglasses including a tarpon, blue marlin and largemouth bass and they used nothing but pieces and parts of sunglasses to make them — lenses for scales, frames for gills, etc. The artists used a mix of lenses, hinges, frame arms, nose pads, side shields and retainer-cord segments from hundreds of Costa sunglasses to create the mounted fish sculptures. Each fish was built using a lens color and frame that you’d typically wear to catch that particular species. 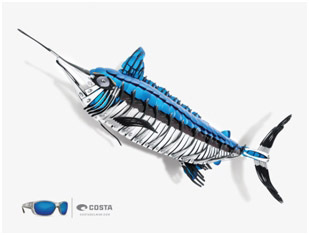 The blue marlin model glows with dozens of Costa’s 580 blue-mirror lenses as scales and silver and black frame arms as fins. Side shields and retainer cords add realistic detail to the body of the billfish. Green-mirror lenses, nose pads and hinges work together to create a lifelike bass. For the tarpon’s scales, the artists used more than 150 Costa 580 silver-mirror and gray lenses. The fish also features frame arms to shape the fins and mouth, with a Costa ‘C’ logo accentuating its eye. Model makers McConnell & Borow/PropArt in New York were tapped for the job. The firm specializes in creating award-winning miniature sets, props, displays and editorial illustrations using a variety of materials such as acrylic, wood, metal, glass, plaster, clay, resin — and now, sunglasses. Costa plans to donate the fish sculptures to fishing and outdoor advocacy groups later this year. For more information, call 800-447-3700 or visit Costa Del Mar.